Application "Do's & Do not's"
Blaine Vice grew up in a family owned citrus and avocado nursery business in the 70’s. After graduating from Cal Poly San Luis Obispo in 1986, Blaine took over operations of the family business and became the 4th generation to do so. The devastating freeze of 1989 forced the sale of his business in 1994. Blaine facilitated the transition and training for the new ownership and management, then left to start Soil Technology in 1996. With an education in soil science and crop production, and as an agronomist of 9 years, he began consulting with growers of strawberries, avocado, lemons, mangos, and a variety of other crops. 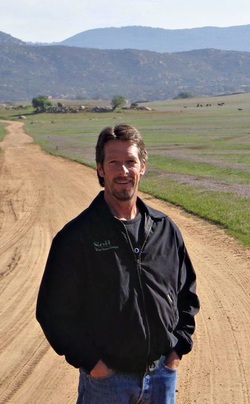 Blaine has always had a desire for innovative ways of producing healthy plants and crops, and has spent many years validating the performance of a variety of soil amendments. Blaine has done extensive research in plant nutrition, soil biology, and disease management. One of his passions is the investigation of soil chemistry and how it can be influenced to improve sustainable plant health and vigor. We are passionate about putting our unique skill set and innovative product development programs to work for you in a way that matches your goals and objectives. Ron Sharp is a seasoned business leader and successful entrepreneur with 40+ years of experience serving in management and senior executive roles for Fortune 500 companies and regional & national real estate development firms, including a company with over $2 billion in assets. Ron also founded several highly successful business ventures to include a timeshare development company that was sold for mid-8 figures in 1997. In his last position as Senior V.P. & C.F.O. of Welk Resort Group, Ron was part of a new team that grew sales by 900% achieving significant and sustained earnings. In addition, he borrowed in excess of $180 million to sustain Welk's growth and managed a receivables portfolio that exceeded $150 million. Ron retired from Welk in 2010 and has primarily managed real estate investments in the Western U.S., Mexico and Fiji. This includes Taveuni Palms, a boutique resort in Fiji that has won over 10 international travel awards, is consistently rated 5-star on Trip Advisor while sustaining a nightly rate of over $1,500. Ron is assisting Soil Technology as Executive V.P. - Business Development and believes that what they offer is timely and valuable in the current water crisis. While Blaine was busy starting up the company in 1996, Bonnie worked at a law firm in Escondido and over 20 years of experience as a paralegal prepared her to manage the day to day operations at Soil Technology. Bonnie also handles and oversees all the legal transactions. In early 2017, Bonnie decided to transition from the legal field and join the Soil Technology team. Teresa was born and raised in Fallbrook and enjoys working within her community. She has personally known Blaine and Bonnie Vice for over ten years and enjoys being a part of the Soil Technology family. Teresa's past experience includes working at local bed and breakfast, as a Calvary Chapel Fallbrook youth intern and Children's Ministry Director, and as a certified instructor and coach for Martial Art Concepts. Those experiences combined with her current position as Events Coordinator at Calvary Chapel Fallbrook and as a wife and mother, has equipped her greatly to be organized, creative and efficient. Of course as a young California native, Teresa, her husband and now their son, enjoy all the sunny climate has to offer and you can find them riding dirt bikes, water-skiing, surfing, snowboarding, rock climbing or hiking...it all depends on what season it is. And, don’t take our word for it. See what others are saying about Soil Technology and their system of precision fertigation!